FRANKFURT -- Daimler CEO Dieter Zetsche has no plans to hand over the reins of the company's Mercedes-Benz cars business to his top lieutenant Wolfgang Bernhard, even if some investors call for him to cede control due to the group's profitability lagging its two main German rivals BMW and Audi. 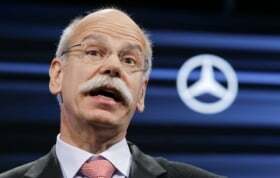 Zetsche said his dual role as head of Daimler and Mercedes increased his effectiveness. "I am convinced that I would be a considerably worse CEO of the group if I wasn't deeply anchored in its operating business," Zetsche told Reuters on Tuesday. "I would also be much worse a Mercedes chief if I didn't have the opportunity to shape its fortunes directly and with all consequence and determination." The ex-Chrysler boss was first appointed head of Daimler in July 2005. He took responsibility for Mercedes the following month after rival CEO-candidate and then-Mercedes chief Eckhard Cordes decided to leave the company. Asked about accepting the post, Zetsche called it "one of the best decisions I made so far." Auto industry analyst Arndt Ellinghorst of Credit Suisse said Daimler shares need a catalyst to outperform. He said Bernhard, who is Mercedes production and procurement chief, would be the catalyst if he took over day-to-day responsibility for the car business. "The most material trigger for the stock is news regarding change in management in February next year. Our most likely scenario is an extension of group CEO Zetsche's contract, which we expect could also result in Dr. Bernhard becoming CEO of Mercedes cars," Ellinghorst wrote late in September.